After a generation of rising inequality, Sarah Jaffe’s Necessary Trouble shows us a new world trying to be born—a web of extraordinary people organizing, building power in the cause of a reborn American democracy. Sarah paints a clear picture of the very real inequalities facing working people today, as well as the anger, energy and optimism that is fueling movements and activism across the county. From Occupy Wall Street to Black Lives Matter, this book proves that there is incredible power when people come together to take back the power that belongs to them and change the rules so everyday people can win. Without a doubt, Sarah Jaffe is the preeminent social movement chronicler of her generation. Cutting through the hype, she finds the unsung heroes and tells the real story of how change happens. Mixing razor sharp analysis with moving reports from the front lines, Necessary Trouble reveals the interconnections, complexities, and possibilities of nearly a decade of radical uprisings. Read this book now—and then join the revolt. Americans can be a quiescent people. But for the past eight years, we have been in revolt—consider #BlackLivesMatter, Moral Mondays, the Fight for $15, Occupy, the Bernie Sanders campaign, fights to save the public sector in Wisconsin and Chicago, and many more insurgencies. Yet few journalists have properly chronicled this moment, much less explained how and why such efforts came about, or analyzed their relation to one another. In this whip-smart, informative and inspiring book, Sarah Jaffe has done all that and much more: she has also summoned us to join in and make history. We must heed her! 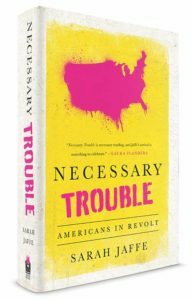 Necessary Trouble is an engaging and insightful guide to the new American radicalism that erupted in the wake of the Great Recession. Jaffe deftly exposes the roots of anti-establishment activism across the political spectrum, from the Tea Party to Occupy Wall Street, the Black Lives Matter movement, and the Fight for $15. A must read for anyone interested in the nation’s future. What kind of troublemaker is Sarah Jaffe? The Tom Paine, Frederick Douglass, Ida B. Wells, and Upton Sinclair muckraking, radical kind. She identifies the issues that must be addressed and then finds the rebels and rabble-rousers, agitators and change makers who are doing the addressing. She amplifies their voices with a power that demands an immediate response to the age-old question: Which side are you on? I’m ready with my answer: If Sarah Jaffe says it’s time to fight, I’m in. Sarah Jaffe draws on her journalistic experience and talent to give us a vivid portrait of the contemporary protest movements that just may transform America. Sarah Jaffe has written a wise and eloquent book about the surging movements against inequality that are giving the one percent a run for its money. If you want to understand the present and future of the American left, you must read Necessary Trouble. Declarations of democracy’s demise are greatly exaggerated. Democracy has been in bloom since the 2008 economic crisis, flowering in the Great Ape-Snake War, in the South’s Moral Mondays, in the Black Lives Matter Movement and the Fight for 15, in the streets and halls of government in Chicago and Detroit, Seattle and St. Louis. While commercial media can’t seem to turn away from the Trump circus or Hillary’s emails, Sarah Jaffe follows America’s new radicals. And in doing so, tells a far more consequential story—one that reveals our recent past and an alternative future. The most compelling social and political portrait of our age, Necessary Trouble should be mandatory for anyone who thinks justice is necessary. Like Boadicea leading the Celts against the Romans or Joan of Arc breaking the siege of Orleans, Sarah Jaffe marches into the class war, fighting the good fight with a pen as sharp as any sword.